It took a while for me to get into Night Circus, but then I accidentally Metro'ed all the way to Silver Spring last weekend because I was so into the story I missed my stop! Which means a) the book is good, b) I am a space cadet, or c) both a and b. The story is about magic, but it’s not fantasy, and it’s realistic(ish), but it’s not magical realism. 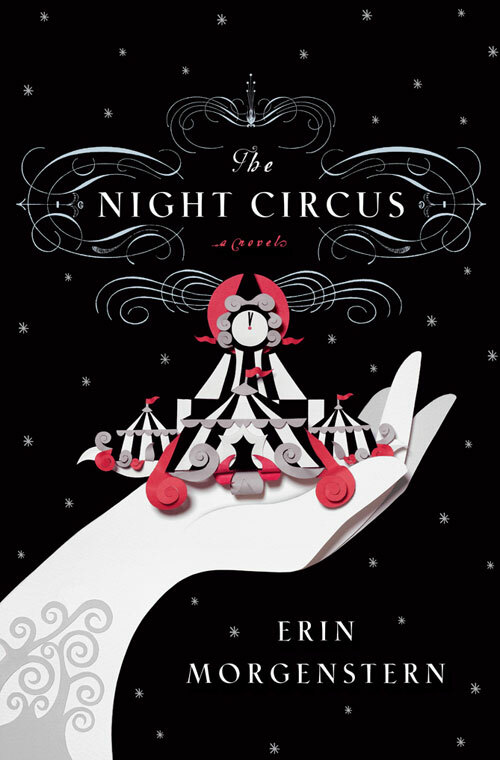 Night Circus by Erin Morgenstern is exactly the kind of book that I usually like. It’s centered around The Cirque des Rêves (literally “Dream Circus”) that takes place at night and is famous for wild magical acts and laws-of-nature-defying tents. I think Morgenstern did a great job of grounding her fantasy in fact. The book was just magical enough to be fun and fascinating with a minor suspension of disbelief, but not soooo much that it lost me (as happens when I read magical realism - Rushdie I'm looking at you). The main characters are Marco and Celia, two young magicians who have been groomed to participate in some grand challenge of magic that neither of them or anyone around them really understands. This is Morgensern’s first book and it is impressively complicated. The narrative jumps around in time (each chapter starts by noting the date) and perspective, but all comes together very well at the end. I found the non-linear format mildly annoying, in that for a lot of the book I wasn’t really sure when the action was happening and had to flip back to understand the order of events. But the book got better and better as I read – for the last 200 pages (it’s 400 total) I couldn’t put it down! Read a good review here. The novel opens with a quote from Oscar Wilde: A dreamer is one who can only find his way by moonlight, and his punishment is that he sees the dawn before the rest of the world. How is this sentiment explored in The Night Circus? Who in the novel is a dreamer? And what is their punishment for being so? Why are Frederick Thiessen and the reveurs important to the story? Why do you think some people were so entranced by the circus that they devoted themselves to following it around? What did you think of Bailey? Why do you think Bailey was willing to give his life to the circus? How does the following statement apply to both Le Cirque des Rêves and the competition? Which audience is more valuable: one that is complicit or one that is unknowing? Why does the man in the grey suit feel so passionate about stories? What sort of commentary do you think the chapter "Stories" is on the novel? On life? The book takes place at the turn of the 20th century. Why does Bailey’s business card provide an email address? Have you read Night Circus? What did you think?